My Kyokushin Karate training began in Poland in 1973. Prior to that I had a successful career in swimming and amateur boxing. Training was very different at that time. The coaching was poor but everyone had a big heart for fighting. It took our group several months before we realized that there are rules in fighting. I still remember my first training where I was asked to fight. "I punched someone in the face and next I remember being thrown to the ground. We used to fight every class but once a week we had more serious fights. We called that day “bloody Thursday” for obvious reasons." I have trained under various instructors in Europe, North/South America and Japan. I received my first degree black belt in the late seventies. I was graded Godan (5th degree black belt) in 2000. I received a unique degree in coaching (specializing in boxing) from the University of Physical Education in Poland in 1982. I have taught and coached many winners of European and Canadian Contact Karate Championships since then. I have participated in all levels of tournament fighting including the World Championships. I have won several major international contact karate contests. I consider the last European Kyokushin Karate Championships (I participated in) the most memorable. I shattered my foot in the first round but I continued to fight several more rounds winning the bronze medal. "When I thought the fight was over the doctor overdosed me with painkillers, sending me to the hospital. At that point I was called back to the fighting area." There was a draw in breaking competition and the European Champion had to be determined through an additional round. I remember standing very dizzy in front of a few thousand people hoping that I would not miss the boards while trying to break them. At the end I broke a stack of seven one inch boards winning the title. Over the years I have won several Best Breaking, Best Technique and Best Spirit Awards. Some of them I consider more valuable than winning gold medals. 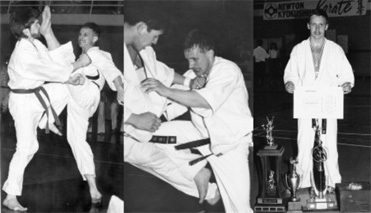 I won the Canadian Kyokushin Karate Championships in open division in 1989. I also received the Best Spirit, the Best Breaking, the Best Technique and the Best Fighter trophies during that tournament. After the 1989 Championships I won one more international tournament in Hawaii and decided to finish my fighting career. To this day I continue to be fascinated with every aspect of fighting. I believe in cross-training and that learning never ends. I also believe that the strength of your mind can overcome other weaknesses. I obtained a Master Degree in Physical Therapy from the University of Alberta in 1994. Professionally, I am a physical therapist specializing in manual therapy (orthopaedics) and various forms of needling, working for the OPAU at the University of Alberta.